The sea of life ebbs and flows, and during these ups and downs, you must stay present. Often, however, these transitions tend to arouse resistance from deep within the ocean of the psyche. When confronted with change (even a positive one), it can be easy to slip into the nostalgia of the past. It can appear safe there, but this "checking out" reverts us back to familiar stories, preventing us from experiencing the freedom and growth that exists only when you flow with the changing tides, not against them. These five yoga poses will help you set your sails during the most difficult times in your life, guiding you back into calmer waters. Grief creates intense sadness, a void in the heart so huge that it can become physically debilitating, and regret for words left unspoken. Practicing opening the heart and throat areas (think: get it off your chest) helps support you through this process. Remember, what you do not express, you repress. Begin in a supine position, knees bent, feet on the floor. Bend your elbows and ground your forearms as you lift your shoulder blades off the mat. Open your chest, gently tilting your chin toward the sky until you can rest the crown of your head on the floor. Straighten your arms and legs if you feel comfortable in the backbend. Relax your lips, allowing the breath to cleanse the throat and nourish the heartspace. Neck Pain? Try the supported variation. Any change in a living situation, from moving, to the arrival of a new baby, or even family visiting, can leave you feeling uprooted. Without a safe, supportive, and stable home environment, sleep can suffer—zapping your energy, compromising your immune system, and making it difficult to focus. This version of Frog Pose helps alleviate the stress that accumulates in the hips and lower back from worry and fear. From tabletop position, walk your knees out to the sides, feeling your way gently into the inner thigh and groin areas. Stay within your comfort level; a little bit goes a long way here! Gradually lower your forearms to the floor, extend the elbows,and rest your head on the floor. Release slowly, easing one leg in at a time, resting in Child's Pose, before standing up. Ankle or Knee Pain? If you cannot turn or flex your feet outwards, rest on your shins and the top of the feet. Whether you’re swimming in the depths of a new infatuation, or healing from a love lost at sea, relationship transitions make us lose our footing. This twisting pose helps you keep your eye on the land without being swallowed up in the abyss of coupledom. You need strong roots, a flexible spine, and a wide open heart—all of which help you balance time for YOURSELF, while you cultivate deeper intimate connections. From a seated position, bend your left knee (similar to a Tree Pose), grounding your sit bones. Cross your right leg over your left, keeping the right foot close to the outer left thigh and flat on the floor. Make sure your hips stay put! Stretch your left arm towards the sky to lengthen your spine, and begin your twist by placing the left elbow outside of the right thigh. Place your right hand behind you for support, gazing over the right shoulder. Release after five deep breaths. Do this on both sides—nobody likes a one-sided relationship. Career shifts bring in anxiety over new territories to master, grief from losing a past version of the self, and financial worries. This can strain all other relationships. Dolphin pose requires a shift in perspective while maintaining a steady base for balance. Begin in a forearm plank, keeping your elbows no wider than your shoulders. Walk your feet towards your arms and lift your hips similar to your Downward Facing Dog Pose. This plank variation strengthens your arms, core, and quadriceps, while maintaining a supple spine and expanded heart. Gaze toward your toes, keeping your head off the floor. Release after 10 breaths into Child’s Pose. Weak Shoulders? Interlace your fingers for stability. Discomfort, frustration, and pain teach us lessons that shape our identities and create the paths we choose in life. These wake-up calls show us our own mortality, forcing us into modifying not just our yoga practice, but also our approach to life. Seal Pose helps you slowly enter your backbend to a point that feels beneficial, rather than moving too far or too fast like in Cobra or Upward Facing Dog. 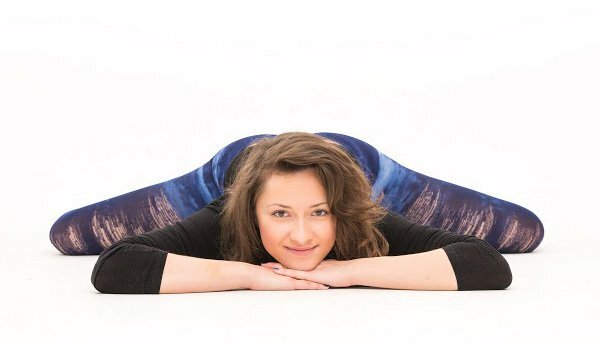 Lying face down, stretch your arms straight in front of you. Lift your chest and stretch the front of your belly. Do NOT over-arch the lumbar spine. Explore the right height for you by bending and straightening the arms until you feel a gradual opening in the upper chest, and gentle traction through the thoracic spine. Keep the legs relaxed, feet slightly separated. Hold this for five minutes. Lower Back Pain? Support your weight on your arms as much as you need. Sometimes, life’s waves crash, completely submerging you in the unknown. Other times, you will ride them into the sunset. Gasping for breath or grasping for stability will only create panic. Believe, however, that change is on the horizon. Keep looking towards that skyline and know that even a tsunami can't sink you, Yogi!